The Olympus ME33 boundary microphone is the mic that I recommend for recording medium and large focus group discussions. There are several reasons why, and I’ll touch on them later on in this review, but first a couple of suggestions. If you are looking to record focus groups, meetings or conferences in a boardroom setting, I recommend you also read this post on how to record focus groups and this post on choosing a recorder for focus group discussions. Those two posts additional tips that’ll help you capture great sound in a boardroom setting. You can connect up to 6 mics. Captures very little background noise; but captures distant voices very well. Sleek, attractive design. Only works with digital recorders with plug-in power (1.5v-5v). They are not cheap. These microphones are perfect for recording audio in large meeting or conference rooms. Also great for recording focus group discussions with a large number of participants. Buy it now from amazon – you won’t regret it. 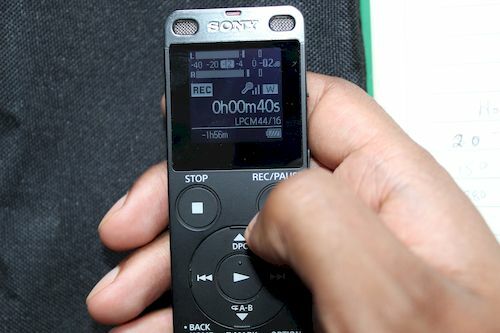 Digital recorders are great for recording qualitative data. However, for optimal recording quality, you need to place them close to your subject(s). Now, if you have a large number of participants, you can use multiple recorders and place them strategically around a room. But, you will need to do a lot of work in post synching up the recording. 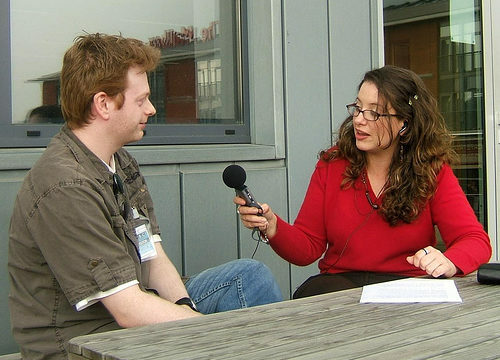 Easy enough for someone who has audio editing knowledge, but for most of us it’s not easy. 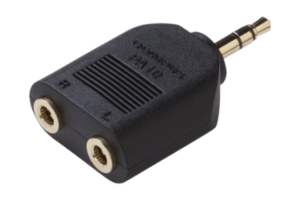 The Olympus ME33 boundary mic provides an elegant solution; daisy chain connection. That means that when you connect 2 microphones, you’ll get one output. And you can connect up to 3 Olympus ME33 microphones in a daisy chain. 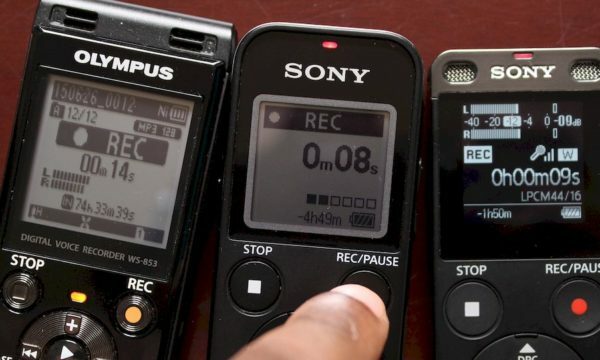 So you’ll get the coverage of 3 digital recorders, but only one audio file. 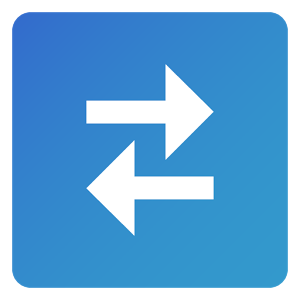 No need to sync audios in post. But there’s more. The Olympus ME33 is a monaural microphone. Which means that it only records on one channel. In stereo setting, it will record in the Right or Left channel. 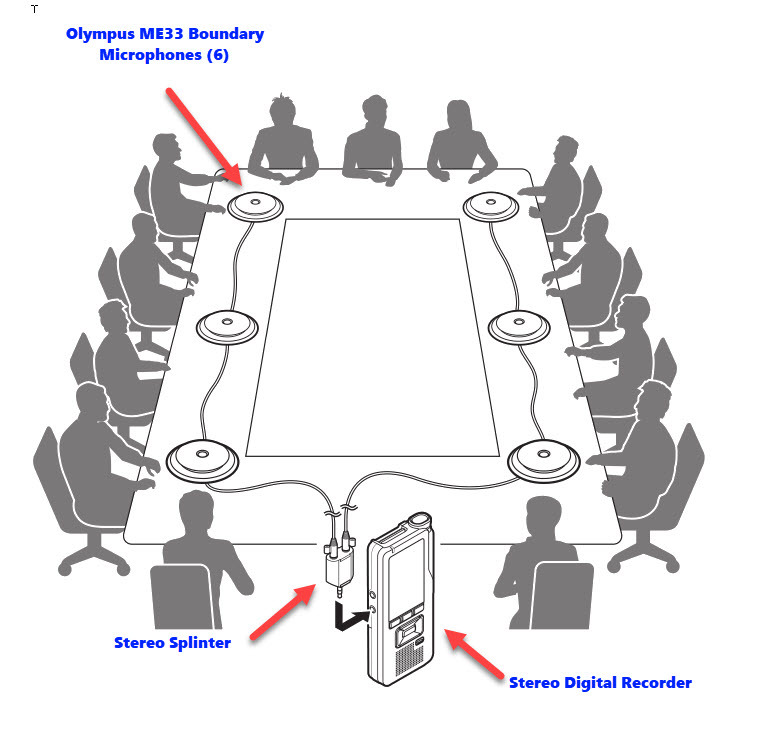 So, you can connect 3 Olympus ME33 boundary microphones in a daisy chain and they’ll record audio into the Left channel of a stereo digital recorder, and then add another set of 3 Olympus ME33 boundary microphones in a daisy chain and they’ll record in Right channel of record. Brilliant! That’s why when you read Olympus ME33 boundary microphones documentation, it states that you can daisy chain up to 6 microphones. You’re actually daisy chaining 2 sets of 3 boundary mics, using a splinter (comes with the mic) to separate the stereo mic input on a digital recorder into Left and Right channel, and using that to connect the 2 sets of daisy chained microphones to a voice recorder. I’ve had questions from researchers about how this setup works. Hopefully I’ve explained it well enough that you’ll now have a good understanding of how to set them up. It’s easy as, place them on the conference table, connect the mics, plug them into the recorder; press record on the recorder to start recording. Very easy. 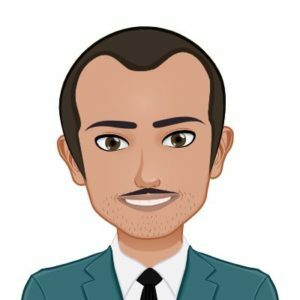 If you have any questions, please post them in the comment section below and I’ll be glad to help. Alright, back to the review. Let me start with the features of the Olympus ME33 boundary microphone that I like. I really like the daisy chain feature. I own a USB boundary microphone and it does not have this feature. I can only imagine what I could do with it if it did! You can also use 2 Olympus ME33 boundary microphones without daisy chaining them. So you have a lot of options on the number (1-6) of Olympus ME33 mics you can use to record your qualitative data. Basically, the larger the room, the more mics you need. From my testing, I’ve found that optimal coverage is around a 4tf radius. For a 15 ft long conference table, you only need a 2 of them. If the table is really wide, more than 8 ft, you’ll need more. I’m also impressed with the quality of the sound captured. 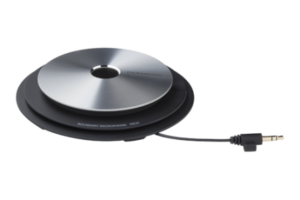 Olympus rate the sensitivity of this boundary microphone as -35dB (it will capture any sound that’s above -35dB). That’s high. I’d expect it to capture a lot of background noise. But it does not! In fact, I’ve compared the Olympus ME33 boundary mics with all other mics/recorders that I own and it captures the least noise. In addition, it does a capture distance voices very well. So low noise, good audio coverage. Perfect. Finally, it look good. I recently used the ME33 to record a stakeholder meeting and I could tell they were impressed by the shiny thing in the middle. As I said, I own other boundary mics (because they so good at noise isolation), and the Olympus ME33 has the sleekest design. And it’s also very easy to store. You wrap the 6ft cord underneath each mic, very neat. Kudos to the design team at Olympus. Plug-in power. You need plug in power to use this microphones. It only works on digital recorders that provide plug in power of 1.5v- 5v. I don’t know why Olympus did not power this with a separate 1.5v battery (there’s definitely enough room in the casing). But the plug in power requirement means that I cannot connect the ME33 to my computer/laptop, phone and so many other devices. 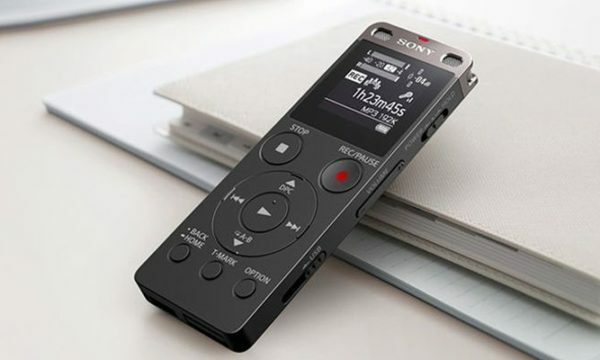 I am restricted to using a digital recorder with plug in power. Now, most digital recorders have plug in power, but how much varies. And if you are connecting 6 boundary microphones to a recorder, you’ll need a lot of power. From my testing, I’ve found that the Sony ICD-ux560 will comfortably power 2 boundary mics. For more than 2 boundary microphones, the Zoom H1n works very well. My other gripe with the Olympus ME33 is that it has a stereo mic output. I know, I earlier stated that this is a mono mic. It is. But the output is a fake stereo, a mono channel doubled up. It’s not Left and Right channel, but one channel duplicated. Why is this important? If you connect the Olympus ME33 directly to the recorder (without using the splitter), you get a stereo recording. But if you connect one Olympus ME33 boundary microphone to your recorder using the provided splitter, you’ll generate a lot of white noise! The Olympus ME33 captures very little background noise, but captures distant voices very well. And you can connect up to 6 microphones using its daisy chain capabilities. All that equates to very large coverage. That makes this microphone perfect for recording audio in large meeting or conference rooms. The only downside: you’ll need a digital recorder that provides plug in power… buy the ME33 from Amazon. Olympus ME33 Boundary Microphone Manual. Posted in: Best of, Focus Group, Recording. If you connect a single one of these to the Zoom H1, is there a way to set it up so both this and the zoom record? Or will the mics in the Zoom H1 turn off so only the external one does the recording? You’re right, once you plug in an external mic the H1n automatically turns off the internal mics. And there’s no way (that I know off) of turning off this default action. If you don’t mind me asking, why do you need to record the internal mics? Wanted to save money by having the recorder at one end of the table and the mic at the other end instead of needing to buy two of the mics. Thanks a lot Isaac. This website is so helpful! I still have two questions. – I will be using two Olympus ME33 boundary microphones. Should I plug each on the stereo splinter and then the steroo plinter on my SONY ICD recorder? Or should I plug microphone #1 on microphone #2, and microphone #2 to the SONY ICD recorder (meaning that I don’t use the stereo splinter at all)?